ONYX is proud to present an exceptional Schumann recital by the outstanding Austrian baritone Florian Boesch. The recital consists of the greatest Heine settings, the op24 Liederkreis, plus many of the great Romances and Ballads including Belshazzar (Belsazar). Boesch is rapidly becoming known as one of the most truthfully dramatic lieder interpreters of our day, and made a sensational debut at the Edinburgh Festival in 2005 with Martineau. 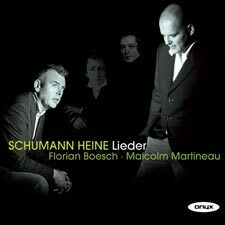 Florian Boesch studied in Vienna with Robert Holl. In 2003 he made his operatic debut with Opernhaus Zürich as Papageno, and is now working with many of the world’s greatest conductors including Gergiev, Bychkov, Harnoncourt, Herreweghe, Viotti and Adam Fischer. Despite his opera work he is perhaps unusual in devoting much of his time to lieder with performances at London’s Wigmore Hall, Concertgebouw Amsterdam, Edinburgh Festival, Mozarteum Salzburg, Wiener Konzerthaus, Palais des Beaux-Arts Brussels, the Schubertiade Festival Schwarzenberg. Myrten op.25: No.21 Was will die einsame Träne?